Welcome once again to the weird and wonderful workings of my overactive imagination! 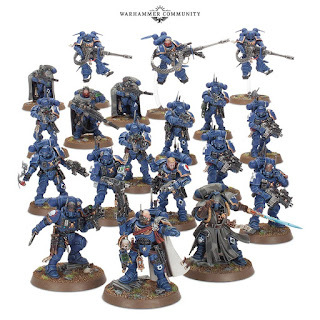 I’m still thinking about Primaris Marines a lot, and despite gaping in jealous wonder at the nasty combinations that Chaos Marines appear to be about to receive in the form of new rules, prayers etc to go with their new models, I’ve been thinking in particular about Primaris Infiltrators and what the implications for them might be from previous releases by GW. And then of course the implications of what might follow beyond that! So, what the hell do I mean by that? Welcome to my detailed review of the Primaris units within the Space Marine codex. I’m very much hoping for this to be a ‘living’ document for want of a better term, and so as FAQ’s etc are released I’ll update this, and any comments or insight that you guys can provide will most certainly be added to the review. I’ve tried several times over the years to define a method for assessing units, and my latest iteration of that will take an appropriately legendary 40k approach, which I’m calling the MARBO method. This section will cover all the mobility stats and options available to a particular unit, assessing whether it’s a strength or weakness of the model, what can be done to mitigate any weaknesses or enhance its strengths. Kind of self-explanatory, but equally, I’ll try to look a little beyond the obvious to understand how those auras can be stretched, where they are most effective and how best to utilise them on the battlefield. Auras I have found are one of those areas that has far more depth within 8th edition than many people at first thought, and both their wording and their interaction with the rules can have significant consequences in a game situation. This is probably the simplest, most obvious part of the unit review - a simple assessment of the weapons and wargear the unit has access to. Primaris units tend to have less flexibility in this respect than their mini-marine predecessors so their roles are a bit easier to understand and define, though their utilisation on the battlefield becomes more specialised and tactical as a result. Some units are able to take different wargear or equipment that buffs them in a variety of ways, particularly characters, and there are items of equipment and wargear for most datasheets that is worth investigating in that regard to better understand its use. I’ll also look at the use of relics in this section as they generally fall within the buffs genre. Anything that doesn’t fit within any of the other sections (and I needed something beginning with O to make the acronym work) I’ll cover stuff like stratagems in this section too, where they affect the unit in question or can be used by them. Hopefully by taking a consistent approach to a review of each unit within the book, I can make sure that rather than just telling you what each unit does, I’m giving you more of an idea of how to use the unit and how it plugs into a wider Primaris force. In the future if the posts are well received I may even look to expand the series into other codices as well, but let’s not get too far ahead of myself just yet! Like many of us I suspect, I’ve been eagerly devouring any information I can find on the Shadowspear boxed set recently, watching YouTube reviews from my favoured channels and trawling the interwebs for more in-depth stuff that doesn’t really seem to be available. 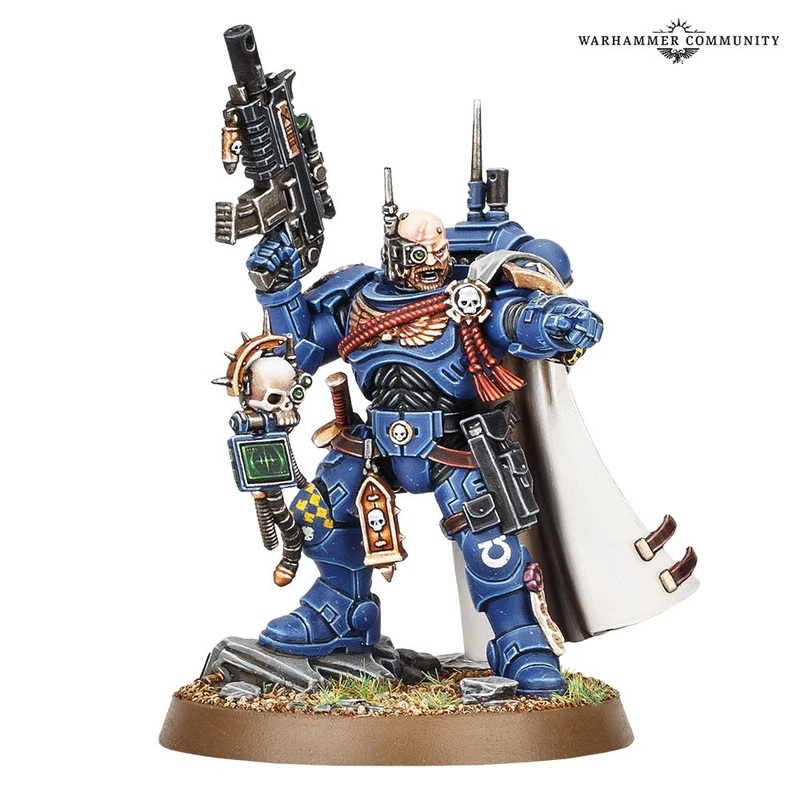 I’m working on an in-depth review of all the Primaris units for this very blog, but the nature of such an analysis means that the posts will take time to prepare. Much as I hate to admit it therefore, this will be a very broad-brush look at the new vanguard units, bear with me please as I play-test them and gain more insight into how they can be best employed. I read a fascinating piece on the Old School Gaming blog today (ok, a while ago now by the time this gets published) about High Fantasy and whether or not it is dying a death. Whilst this post isn’t a response to that, it is most certainly inspired by it, and I’d love for it to become a series of guest posts where my readers (yes, that means you, even if you’ve never commented on my blog) set out their hobby origins and why they are involved in the hobby. 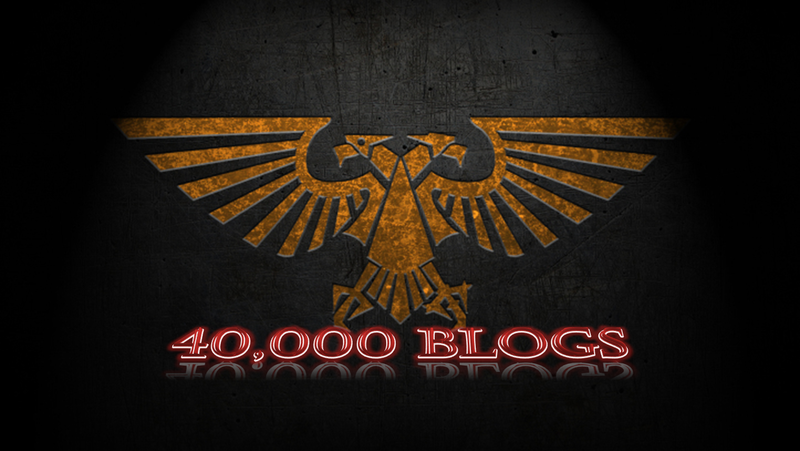 It’s intended to be a similar type of post to Mike Corr’s Better Know a Blogger series, though specifically related to the 40k universe and less Q&A, more exploration of the different facets of the hobby that hook people in. it's about time I posted another hobby progress update I think, I've been conscious for a few weeks now I've not done one for a while but with the pace of real life and the teases from GW I've had other things to do. With that in mind, let's have a look back then at what I've been up to over the last month and a bit! Chapter Master Lox Kaitana completed. I say completed, I think I'm going to go back and re-paint the Dark Eldar corpse on his base, it was done in a bit of a hurry, and I think the red detracts somewhat from the colours of the Marine himself. The Repulsor hasn't moved on much from this point, I figured it was probably just a little too big to be the first model I completed, it should be more of a treat than a standard unit, and it's also obvious it's going to take a big chunk of time and focus to finish it, that at the moment would be better spent focusing on getting the basics of a battalion up and finished. I did find time to get the vast majority of the cupola done however - I'm really pleased with the way it's come out too, the generally subdued tones complemented and set off against the yellow power coils of the las talon. 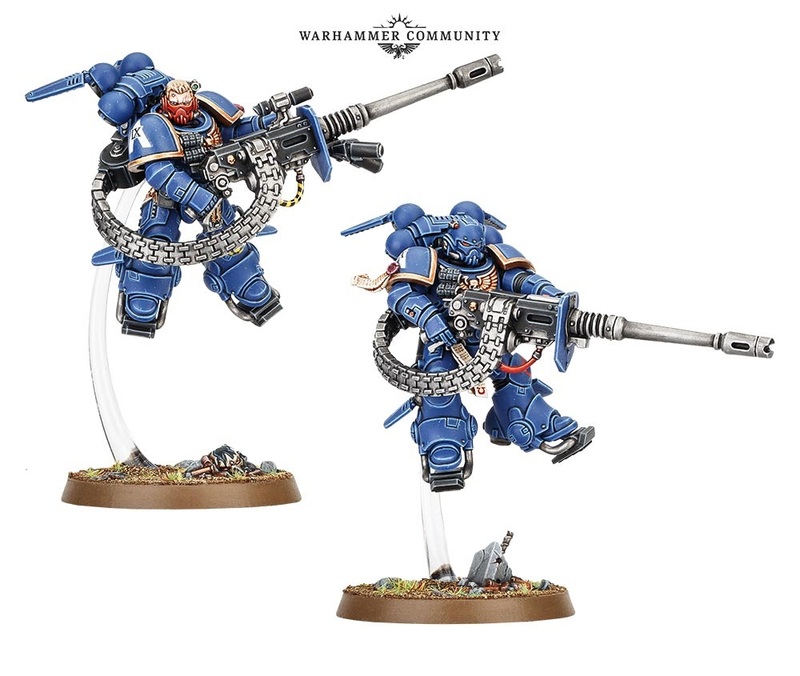 I've started working on the Inceptors too, I'm really pleased with how the posing has come out on them - I can't stand the current flying bases but actually some of the poses work quite well standing on the ground. I particularly like this one, it's got a great sense of movement to it without needing to be in the air. This one however is a much more static pose, but equally menacing and pretty atmospheric I think. A few of the Command Staff of the Chapter and Sabre Company, I really like this picture, though there are plenty more Sergeants to add to it just as soon as I've finished them off. Next up I finished off Kill Team Sabre, half a dozen hand picked members of the Company to represent Captain Darke in missions of a more covert or elite nature. Then I started work on some Aggressors. They're 'big' models, not in terms of their overall scale, but they've got a lot of detail to them and they play a significant role on the battlefield. Plus I was hoping they'd buck the usual trend since they've tended to die early whenever I've used them before now, and since I put some paint on them they've performed much better. A cracking deal, I picked up the Easy to build Redemptor Dreadnought from the Warhammer 40k Conquest magazine. 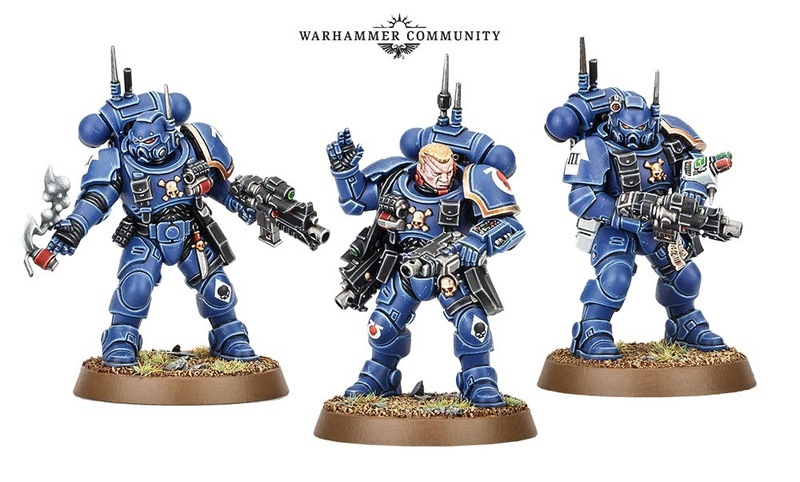 There's a couple more things that I'm looking forward to becoming available, not least of which the Repulsor, the Chaplain and the Apothecary, but for the near future at least there's not much for me to grab. This last week I've been focusing more on the Ancient. I know, hopping around painting most of a model without actually finishing any of them - I'm the epitome of a hobby butterfly, not only jumping from one army to another, but between units of the same army too! He's very much getting there though, and I'm really pleased with how well the banner has come out of it all, plus the white on the helmet has come out really smooth too. Today however I jumped again, and did some work on the not so easy to build Redemptor. It took a good long hour, but it's almost complete, just the skull/scroll to do and some weathering once the rest of the model is complete. Well there you go, that's a quick run down of the last month or so since my last post. Doesn't seem like much? Well that's because there's 27 Tzaangors been progressed as well, but they're for a commission and I'm only going to show pics of that once they're completely finished. Well there you go, hope you enjoyed! Honestly, you analyse one set of leaks and before you know it there’s another landed in your lap! 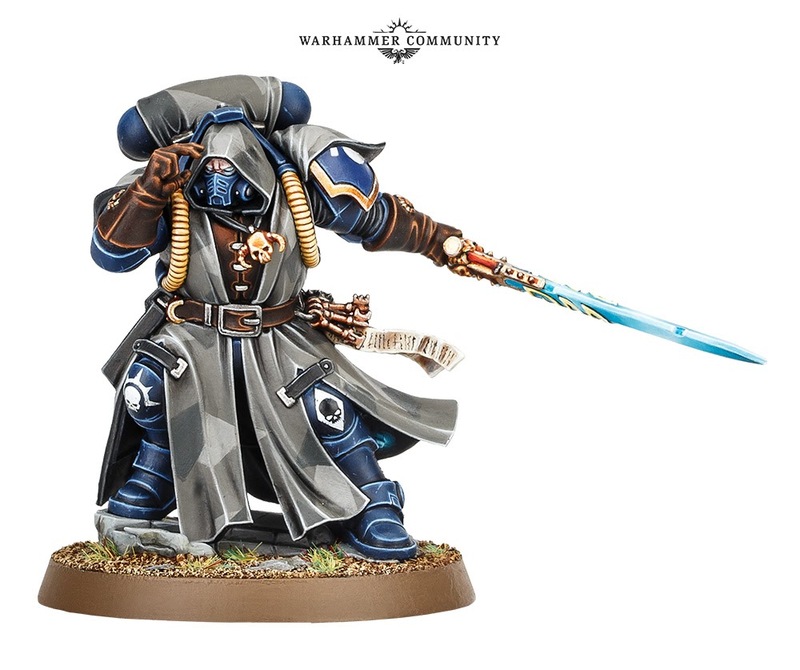 We know the Vanguard Primaris releases are coming soon with the Shadowspear box and contained within it is a new Librarian who accesses the ‘Obscuration’ discipline but what we didn’t know was what those powers looked like. Well now I do (assuming the pic I’ve seen is not an elaborate hoax of course). 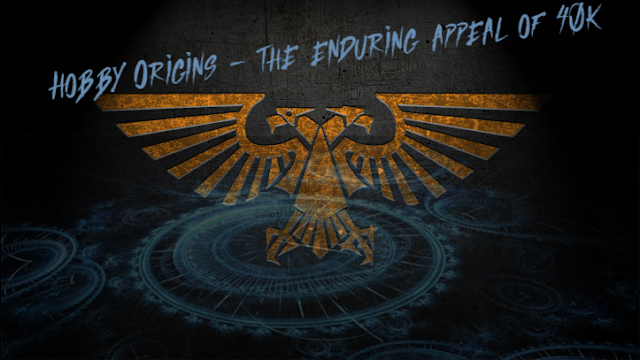 So after last night’s big reveals, I thought I’d better put my thoughts down on what they mean for the Primaris as a stand alone force, where the significant benefits are and how this will change Primaris armies going forwards. I’ll also put down my own thoughts on the physical side of the reveals too, the new units, what I like and don’t like about them etc. Welcome to part 2 of my path to glory series. It’s actually the third game since I started the idea, but since the second game was so very one-sided I decided not to dedicate a whole article to it as there was little to learn. I’ll do a very brief run-down of it first. The third game, which took place last night, was in our club’s knock-out tournament, and was set for 2000 points and pitched the Swords of Dawn against the Blood Angels. 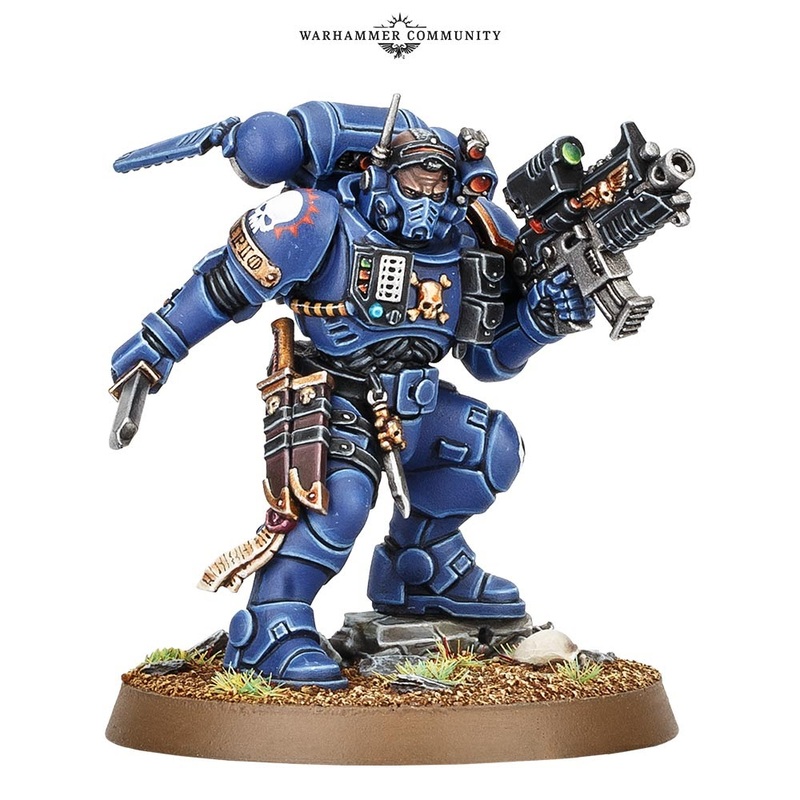 As you may have noticed, the blog has been very Primaris-focused recently, for which I make absolutely no apology! I dropped a fair whack of money on new models at Christmas and I’m keen to get them painted up and working for me on the tabletop. That means that I need to figure out how best to use them, and part of that is experimenting with lists and combinations against a variety of foes. All this experimentation will most definitely feed into my reviews of the Primaris units that I’m working on for the blog. All this focus has also resulted in something else quite significant happening. I’ve sold the Dusk Knights. That’s right, they’re all gone (ok, except for a couple of models that weren’t painted etc). Still, onwards and upwards eh? The only downside I’m feeling at the moment is that I now don’t have a painted army in my ownership (oops!) but then since it’s not something we get too fussed about at my club and I rarely tournament I’m not getting too worried. If it’s still all unpainted in 6 months time I may change that view! Loads of stuff to update you on, so hopefully I’ll manage to get a few more posts written and scheduled over the weekend, but I just had to write something about the reveals from the LVO in the early hours of this morning first. 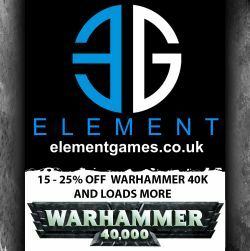 GW, I have to say at the moment you really are smashing it out of the park in my view! 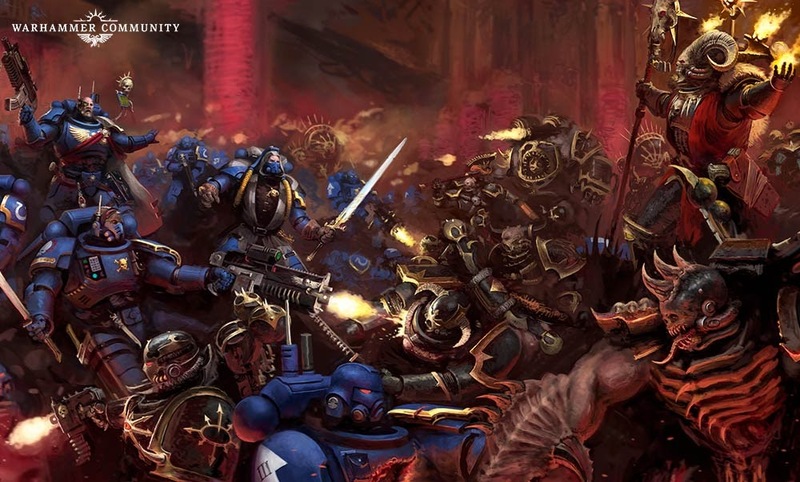 I’m going to concentrate on the Primaris stuff since that’s where my main interest lies, but let’s be honest, those reveals for Chaos are equally as exciting! I thought that as I’m taking a fresh start completely in a lot of aspects of the hobby this year, I’d also try and do regular updates of my games, and add in some analysis of them from a tactical point of view. That’s not to say I want to get all competitive over my armies and my unit choices, but more that in order to improve as a player, I think it’s important to take time to look back on your games and what happened, why and how to improve your play going forward.